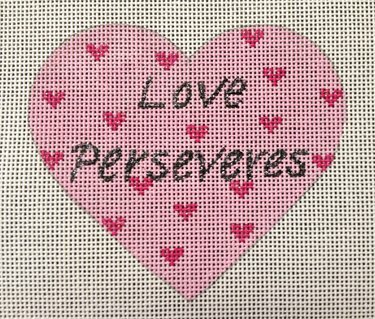 An inspirational heart-shaped needlepoint design by Purple Palm Designs. The design is handpainted onto 18 mesh needlepoint canvas and measures approximately 4" x 4". This inspirational needlepoint design comes with or without fibers. If you select cotton we will send DMC cotton floss. For silk we use Planet Earth Pepperpot boutique fibers which are single-ply for 18 mesh and easy to stitch with. If you choose mixed threads we will use some glisten which will add a little sparkle to your design.